One of the pleasures of being in anthologies with other authors is that you encounter all manner of great stories along the way. I'm in a new anthology from the Sci-Fi Roundtable, the best group of sci-fi and fantasy writers on Facebook. An open call went out for submissions and I was delighted that my story, Second Contact, was accepted. But this isn't about me, or my story. Rather, this is a post in which I'd like to sing, shout and stamp my feet in delight at some of the other stories in the anthology - because it's good, and you should read it. Now, there are some familiar names to readers of this blog in the anthology. You'll find stories in there by Ricardo Victoria, E.M. Swift-Hook, Brent A. Harris, Jeanette O'Hagan, Claire Buss, Rob Edwards... but I'm making a rule for this blog post that I'm going to tell you about three stories from writers I haven't featured in anthologies with before. New names to me - and hopefully new names you might want to find out more about too. So here are three... oh, and there's a bonus one at the end by someone I have shared an anthology before, but you'll see why I make the exception to my rule when we get there. This is the first sample I've had of Darran Handshaw's Engineer saga, in a world that seems to merge elements of Dune and Barsoom, hard sci-fi and soaring space opera. I really like this tale - in which the lead character is lost in the depths of a mountain, only to discover machines conducting their own operations with an unknown purpose. There's danger, there's romance, and it's a genuinely thrilling read. I thoroughly enjoyed this - the kind of story that really hints at a much, much bigger world that begs to be explored. What is life? That's the challenge that formed the foundation of the submissions call for this collection and Alan Van Meter confronts the question head on as a telepathic android questions the nature of souls - and whether it has one, even as it faces being destroyed for reaching the end of its service life. Will it meekly accept its end? Will it start a revolution? What does its end actually mean? In a surprisingly short span, Alan Van Meter weighs some meaty questions - and polishes it off with the kind of ending that makes you wonder, makes you ponder, makes you reflect upon yourself. Thoughtful. This one is very much my kind of reading material. A researcher is conducting experiments examining life energy - effectively killing and bringing back to life his test subjects. The time has come for the biggest experiment of all - on a human test subject. Are the experiments safe? Will there be consequences? This is the kind of story you might see in The Twilight Zone, or lurking around The Outer Limits. What dangers might we invite when we dare to dabble with the infinite? Splendidly written, and with an ice-cold chill running through the heart of it. Now, I did mention a bonus to my list of three, and Cindy Tomamichel delivers roundly on that with a story that made me chuckle heartily. Packed full of in-jokes, it's a raucous romp of a read - in which you might catch a character mildly modeled on me, along with others based on members of the Roundtable group. If you're a fan of sci-fi and fantasy, you'll find the group here. Swing by if fun is on your mind and supporting authors is your thing. And play spot the character from Cindy's story as you get to know the regular knights of the Roundtable. 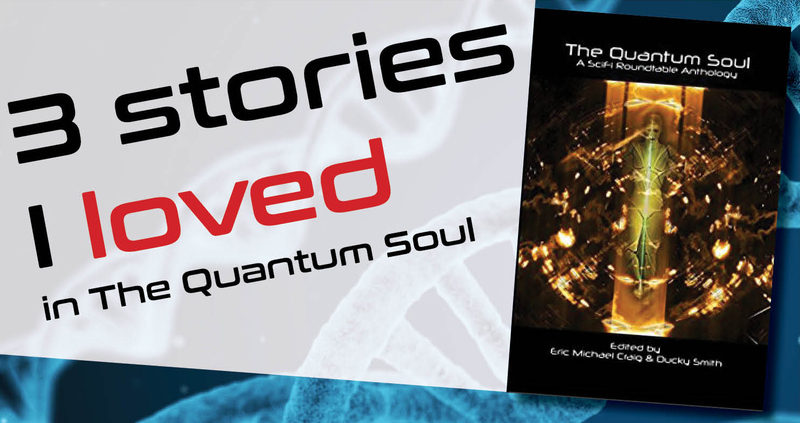 You can pick up The Quantum Soul on Amazon here.